Mine was clean, and the bottom of the tanks are clean. I did put Bio Bore in it last year. As it had 375 gallons of fuel in it. Holds around 470 gallons 4 tanks in mine. And would rather stay ahead of Algae then fight it after it starts. We also still have 2 500 gallon farm tanks. Never figured out why they never had issues? Even when mine sat for a year half full. But never any issues with it. My Kenworth is 22" longer then a Crew Cab dually. 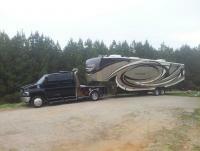 And I will bet you, It will fit anywhere that Dually and 40ft camper will fit. But best of all, the Kenworth is in control of the camper. Not the camper in control of the pickup. And Yes I pulled ours with a crewcab pickup, then a Crewcab Kodiak C5500. And the Kenworth is better around. I get somewhere, I'm rested. Not beat to death by a pickup. Your little Sprinter is great, but would not want to spend a few months in it. While seeing a part of the country for weeks at a time. Been there done that also. Slide-in truck camper. Loved it, but man its cramped after a couple of days. Enjoy your camping and we will enjoy ours. Always people that know there way is better. But as we get older, room and comfort is king. I got in trouble a few years ago over that. Wife and I got out, lady shouted. I needed to park somewhere else. As I was way too big. I was nice and told her, she was Ugly. But they still allowed her to park here. Almost bet that truck has been stripped by now. Been a lot of trucks stolen around there over the years. Most times, its a guy with a bad engine. They work for Spot and Steal. Get the items there truck needs. Then the rest is left for the owner to find. Hope they find it before that happens. My uncles 1976 KW got stolen around there also. They found it later, interior was stripped. Engine, new tires, 18 speed and rears were gone. Plus a Million in drugs, he was hauling for Drug store warehouses back then. Company truck I was driving. They tried to steal in 1986, but did not get out of the parking lot. Company put in a schrader valve in every truck. Under the seat, you crack the valve. And truck would run out of fuel fast. Had to prime the old 350 Cummins a few times. That I forgot to close the valve. But the company never lost a truck with that little trick. I almost sold this one 9 days after getting it. Guy wanted to buy it, I tossed out a price. He offered me $2,000.00 less then I was asking. And I would not drop the price. I scared I had messed up when I priced it. There getting harder to find each day. Like you I found a lot of them. Most were falling apart with rust. It was the scales in Ca outside of San Francisco. Guy claimed the tie-rod was bad. Sat there 12 hours, until the guy showed up with a new one. Put it on and was going to take the other one with him. I would not allow him to leave with it. Turned out the Guy that put me out of service. And the Service guy had the same last name. 🤬 Company and Freightliner last I heard of were taking both to court. As the part he took off was good. But that was in 1995, never did hear how it turned out. We were running team. 7000+ miles per week. And got a new truck ever 90 days. Company rotated us like that . To keep from running the miles up on a single truck. Also these were lease Trucks from Penske. So figure the guy at the scales and guessing his kin. Were in trouble. Seen one in west Tn 2 weeks ago. Guy had a Peterbilt 379, Large Sleeper on it, pulling a 40ft 5th wheel. Sleeper had the side door same as a motorhome. Replaced valve and issue went away. Bubbles were from fuel going back into the tank. After the new valve no more issues so far. But with my luck the last month. It may grow wings and fly away. Been looking for a Bronco the last 10 years. Found one I liked 2 week ago. Got it home, and the fun started. Finding lots to fix 🤬 but it had been sitting 10 years. New gas tank coming in tomorrow. Filled it up with gas, and it ran out on the ground. Or the first 15 gallons did. Click For Full-Size Image. 80,000 miles on the clock. Seats and carpet in great shape. 1989 Eddie Bauer Edition. Click For Full-Size Image. As you can see still has the best Stereo around in 1989. Yes Cassette, glad I still have all of mine from the day. Even have a bunch of my 8 tracks. Still has all the window decals from the factory. So far nothing had been taken off it. Still have the 5 factory wheels. There going back on before winter time. I have been shut down. New Truck had 3100 miles on it. Now I was commercial, but learned what I had heard all the time. Even a new truck, can and will be put out of service. IF they want to find anything wrong. Also In Tn I40 Brownsville Tn scales. They work overtime during there 72 hour inspection. Still think somone offered the winner of the most tickets. A case of Drinks and dozen Donuts. They work harder that time then the rest of the year. And they stay busy year around there. I thought of the o-ring first thing. But with the fuel returning back to the tank. That tells me the check valve is sticking. Got a new kit coming for it. Should be in town by 2pm. Buddy of mine ordered it with his parts this am. Will replace that first. Then go from there if its an issue after that. He had a lot of the o-rings. And I will pick up both of those also. It only does this after parking where the truck is lower on the pass side. That is what is odd about the whole issue. But been told, the ball in the check valve just happens to be bad on that side. Phil I hear the truckers around town. Want to throw you a party. HEHE Enjoy and have fun. My wife has 15 more months, then we can start traveling more. Truck has this happen a while back. Did not think that much of it. Fuel filter will be sucked dry. Only happened when parked where it leans to the right side. 😱 Yesterday it did it again. Grabbed the fuel can, filled the Filter back up. Got it primed, and then it died again. Filled it this time, but seen bubbles coming up and fuel running back to the tanks. So tomorrow will pull the fuel line off the Davco housing. Check valve is not shutting off fuel. And hope that is the only issue. But may turn out to be the fuel pump also. Will post findings when I get done. With my luck the last few month's no telling what I will find. Know of a 12.7 Detroit, that has issues somewhat like that. Guy was working on his charge air pipe. He stuffed a whole bundle of shop towels into the fitting. Then out the charge air pipe back on. He could not figure out why his truck would not pull. Even without the trailer. It was sick as a dog, no power. He got it to the shop, and Tim found the charge air cooler. Was stopped up with red shop towels. To this day he does not work on his truck again. IF you don't think a Turbo can't shove those towels into small spots. Think again, he did get lucky. As they did not make it far enough to destroy the engine or Turbo.